Muammar Gaddafi did not come from an elite background. He was apparently born in 1942 in a tent in the desert near Sirte, as a member of the Qadhadhfa tribe. When he was about ten years old (in 1952) he entered primary school at Sirte, moved to a preparatory (intermediate) school in Sabha in 1959 and, in 1961, entered secondary school in Misrata. 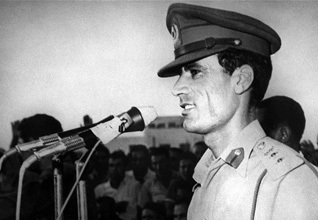 In 1963 he entered the Military Academy in Benghazi. These bare bones have subsequently been fleshed out with details that, in part, had propagandistic purposes. Authorized biographies emphasized three things: his desert background, the nationalist pedigree of his family, and his politicization at an early age. His family was poor, and he was its first member to learn to read and write; while he was at primary school, he returned to his family only at weekends, sleeping in the mosque on weekdays. He claimed that his grandfather, Abdessalam Bouminyar, was killed fighting the Italians near Khomsin in 1915. When he attended preparatory school in Sabha, he was expelled because of political activities, and while at secondary school in Sirte he is reported to have organized a demonstration against Syria to protest the collapse of the union with Egypt. What is certain is that some of his school friendships lasted all his life and provided an eventual nucleus for the Revolutionary Command Council (RCC). A core group knew each other from secondary and even primary school and from the Military Academy in Benghazi, where they formed the Free Officers’ Movement to plan the overthrow of the monarchy. Gaddafi met Abdessalam Jalloud, from the Magarha tribe, at school in Sabha, and they became close friends; Jalloud was the first deputy chairman of the RCC and later became Finance Minister and Prime Minister; Mustafa al-Kharroubi, another future member of the RCC, was reported to be a Sabha classmate too. Another friend from this time was Mohamed al-Zway, the last secretary-general of Libya’s General People’s Congress and thus the theoretical head of state from 2010 until 2011, but he never joined the Army and so was neither a Free Officer nor a member of the RCC. In secondary school in Misrata, Gaddafi met Umar Mihayshi, another future member of the RCC. 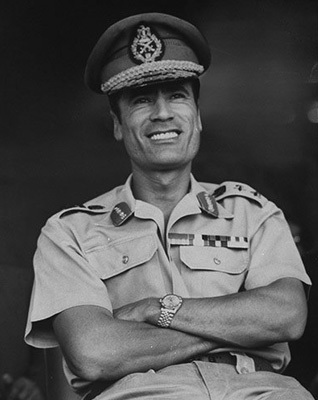 Most of the future RCC members, however, came from the time the Gaddafi was in the Military Academy in Benghazi. Abu-Bakr Yunis Jabr was one – a future Minister of Defence and head of the Army from 1970 until the civil war of 2011 – and Khouildi Hamidi was another.